One set of his studies focuses on oxidative stress in schizophrenia. An ancillary theme is research on the association of free radical metabolism and the pathophysiology of tardive dyskinesia (TD), a movement disorder commonly occurs in patients treated chronically with antipsychotic drugs. Dr Zhang's interest in this area has led to studies that underlined the importance of the antioxidant in the outcome of schizophrenia, as well as TD treatment. A second set of studies lie in the role of viruses and other infectious agents, together with immune dysfunction as possible causes of schizophrenia. A third research interest focuses on genetics and pharmacogenetics of psychiatric illness, mainly schizophrenia and antipsychotic-induced side effects, such as tardive dyskinesia, weight gain/obesity and diabetes. A fourth set of studies utilizes a translational approach to understand addiction vulnerability in patients with serious mental disorders mainly schizophrenia. His main focus has been on tobacco addiction co-morbidity. Acta Pharmacologica Sinica, ACTA Psychiatric Scandinavica, Addiction, Addictive biology, AIDS and Behavior, American Journal of Drug Addiction, American Journal of Drug and Alcohol Abuse, American Journal of Medical Genetics Part B, American Journal of Psychiatry, Antioxidants and Redox Signaling, Archives of General Psychiatry, Behavioral Psychopharmacology, Biological Psychiatry, Bipolar Disorders, Brain Research, Cytokines, European Journal of Neuropsychopharmacology, Human Psychopharmacology, Indian Journal of Psychiatry, Journal of Clinical Psychiatry, Journal of Nutritional Biochemistry, Journal of Psychiatric Research, Journal of Psychopharmacology, Journal of Public Health, Journal of Traumatic Stress, Molecular Psychiatry, Neuropsychopharmacology, Neuroscience Letters, Pharmacology, Biochemistry and Behavior, Plos One, Progress in Neuro-Psychopharmacology & Biological Psychiatry, Psychiatry Research, Psychopharmacology, Schizophrenia Bulletin, Schizophrenia Research, The Lancet. Dr Zhang has a broad background in psychiatry, with specific training and expertise in clinical psychopharmacology and pharmacogenetics in schizophrenia. 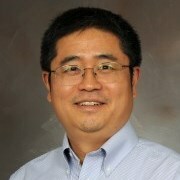 As PI or co-Investigator on several previous Stanley Medical Research Institute foundation NARSAD and NIH-funded grants, Dr Zhang laid the groundwork for the proposed research by collecting large samples from the patients with schizophrenia who had been treated with atypical and typical antipsychotics, and by establishing a large research net all over China, in which 8 large psychiatric hospitals have participated for collaborative efforts, with more than 6,000 inpatients. In addition, Dr Zhang successfully administered the projects (e.g. staffing, research protections, budget), collaborated with other researchers, and produced many peer reviewed publications from each project. Up to date, Dr Zhang has published more than 150 papers in the international peer-review journals. In summary, Dr Zhang has a demonstrated record of successful and productive research projects in an area of clinical psychopharmacology and pharmacogenetic in schizophenia.